I set up a booth to sell and sign copies of Corgi Capers: Deceit on Dorset Drive, donating a portion of sales to ACS. 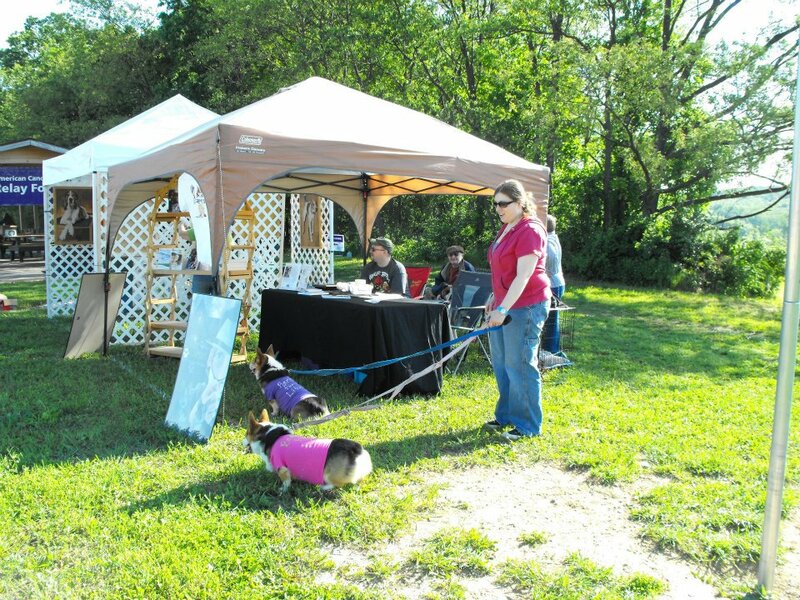 Last weekend, I participated in The American Cancer Society’s Bark For Life event. 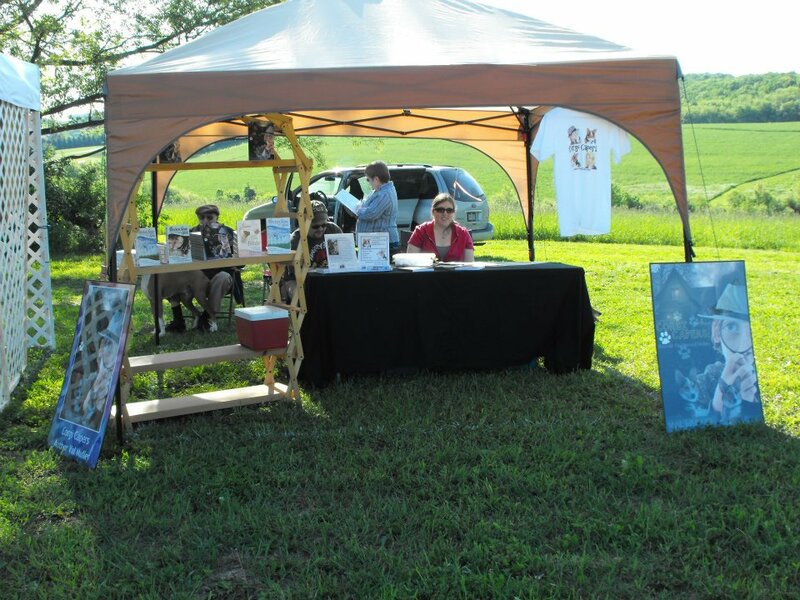 It was organized by Brenda Mahone of Hanover, PA, and was the first event of its kind there—but it was a great success. We had a beautiful day at the West Manheim Township Recreational Park. This is a huge park, lush and green, with rolling hills and two large fenced in dog-play areas (one for small dogs and the other for large ones). The walk commenced with a one-mile fun walk for dogs and their people, and the day ended with dog contests and a search-and-rescue demonstration. 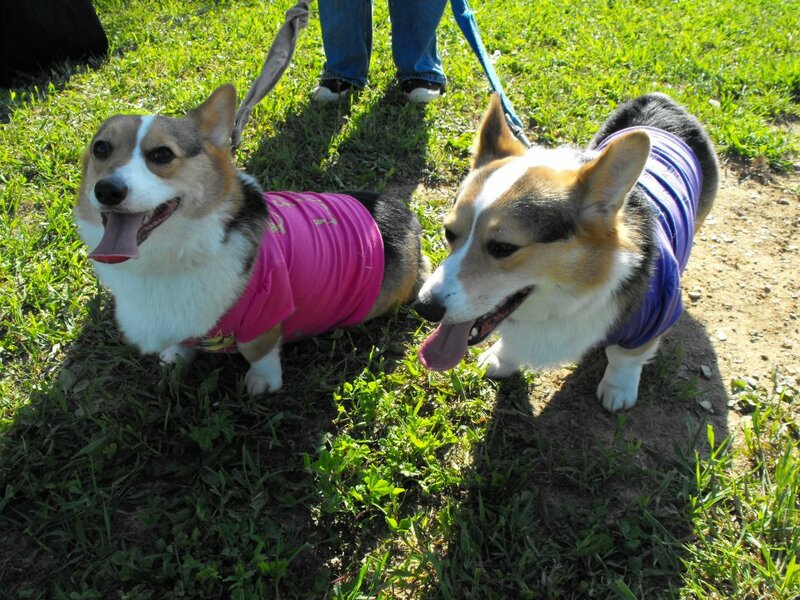 Bark For Life raised over $500 to help the fight against cancer. Being a dog person, I enjoyed a major theme of the event, which is honoring dogs as caregivers to humans, especially those affected by cancer. (See this article for details ) Most of us know someone who is or has been affected by cancer. Sometimes, all it takes to reverse a bad day is a happy look from a dog and a wagging tail. Overall, the day helped to reinforce the positive side of human beings. With so much negativity in the world, and so many challenges (cancer being one of them), it’s good to know that people can come together and rally for a good cause. The day was filled with optimism and good cheer, with people glad to know they were helping to raise money for a good cause, with stories of cancer struggle and survival—and everyone already looking forward to next year’s event. It goes once again to prove that dogs do help make the world a better place. So no matter how bad your day or life seems to be going, just think that it could be worse: we could live in a world without dogs. To see more pictures of the event, check out the West Manheim Township Recreational Park’s Facebook page at http://www.facebook.com/WMTpark (photos courtesy of WMT Recreational Park). Posted on May 20, 2012, in corgi, corgi capers, inspiration. Bookmark the permalink. Leave a comment.